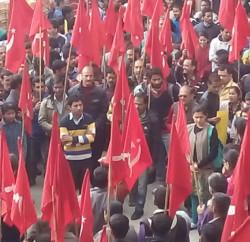 The CPM supported six different organisations hold a rally at skating ring Shimla. 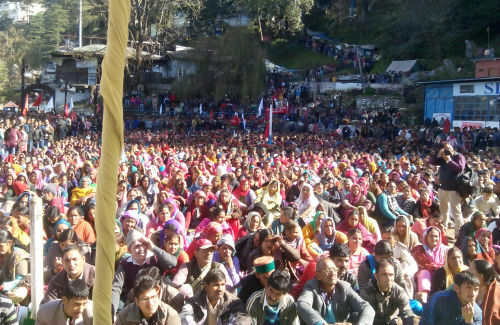 The rally was addressed by A Vijayraghwan former MP and general secretary of all India Khet Mazdoor Union and different speakers of SFI, DYFI, CITU, AIKS, AIDWA and apple growers association (seb utpadak sangh), which was attended by thousands of party workers. 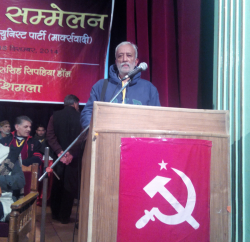 Comrade A Vijaraghwan, in his address, accused the central government for corrupting all spheres of atmosphere from space to earth to even underground where the mineral strength of the country is being sold out and heavy kickbacks have been accepted by the Congress leaders. Targeting the government for heavy price rise he castigated the government for befooling the people and allowing hike even for bare essential commodities and bringing them at par. Rakesh Singha, former MLA and the state president of apple growers association, in his address taken up issues of Govt decision of outsourcing of entire laboratory functions in over 103 hospitals and health centres in the state to a private company Ranbaxy. Singha apprised that as per the MOU signed by the government will be followed by the privatization of other tests and even the para medical staff. He also racked up an issue of non availability of ration in the depots since last 3 months. He claimed that the people weren’t getting sugar since last 5 months. 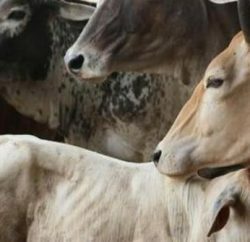 He called it precarious situation in which the entire system is getting eroded and the government is contemplating a move to involve foreign companies for the supply of ration. In the rally CPM also announced to hold state-wide demonstrations. These proposed demonstrations would be held in front of health centres and ration shops. Dr Onkar Shad, general secretary of AIKS Himachal state committee, Dr Kashmir Singh Thakur general secy of CITU, Kapil Bhardwaj President of SFI, Balbir Prashar general secy of DYFI, Santosh Kapoor President of AIDWA, Kushal Bhardwaj joint secy of AIKS, Jagat Ram president of CITU, Dr Kuldeep Singh also addressed the rally.